Class S winner Chelsea Mitchell of Canton was a little short of her season's best 18-8 mark, but she saved her best jump for her last and outdistanced 55m hurdles winner Tess Stapleton of Ludlowe by a little over three inches. Danbury's Meilee Kry was 3rd at 17-7.5, Kisha Francois of East Haven was two inches further back in 4th, Selina Soule of Glastonbury was 5th in 17-4.25, and Olivia Bowes of Hall was 6th in 17-1.75. Class M winner Patricia Mroczkowski of Berlin was a fraction off her season's best but hit 5-6 to capture the HJ. 2018 champ Ally Lewis of Norwich Free Academy and Sydney Garrison of Southington tied for 2nd at 5-4, while Savannah Bromley of Brien McMahon and Tianna St. Louis of Tolland also cleared 5-4 to go 4th and 5th. Allison Schneider of Conard cleared 5-2 and picked up 6th place for having no misses at 5-0. 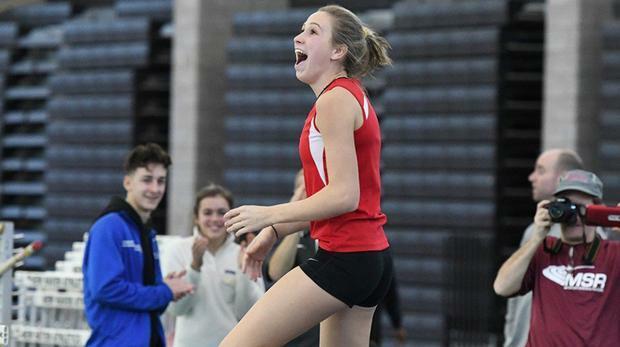 Class LL winner Paige Martin of Norwich Free Academy got the CIAC Open meet record and a big PB as she soared to 12-0.50. Elise Russell of Weston equaled her best mark with an 11-0 vault for 2nd, Glastonbury's Mallory Malz went to 10-6 for 3rd, Paige's triplet sister Madison Martin of NFA took 4th with the fewest misses at 10-0, and Katie Ryan of Newtown and Kelsey Dejesus of Watertown split the remaining points with their 10-0 clearances. Class L winner Susie Okoli of Wilbur Cross decided to again leave everything to her final throw as she did in her conference meet, and she jumped from 6th place to the champion's spot with a throw of 41-0 that topped her PB by a foot and her Class meet throw by two feet. Natalie Rolon of Bacon Academy picked up the silver with a 40-6 toss, Alliya Boothe of Bloomfield was 3rd in 39-9.5, Trinity Cardillo was an inch further back in 4th, Sydney Mello of Lewis Mills took 5th in 39-6, and Payge Boyd of Classical Magnet picked up the 6th spot with a 39-1.50.